All that talk about snuggling up in my fur coat made me yearn for the snow I won't be seeing this year on Christmas. 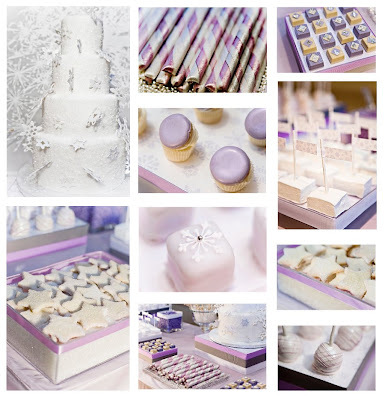 Instead, I decided to bring it to us in the form of Amy Atlas' gorgeous dessert buffet created for an Elegant Bride and the Wedding Library's Wedding Event at the New York Palace. This lavender wonderland brings all the beauty of snow without the treacherous driveways or filthy slush!